Our remote support application provides on demand (only when you request it) and unattended (always waiting) remote access for our support technicians. Sometimes you have an issue that we need to see first hand. We may also need to install and configure software for you, like our PMS and POS applications, or interfaces to phones or reservation systems. This application allows us to control your screen and transfer files. This is typically not required but if we're unable to connect after installing the application, you will want to verify that your firewall isn't blocking outbound traffic. Please make sure your Firewall doesn't block OUTBOUND AeroAdmin traffic on ports 80, 8080 and 443 on the following URLs and IP addresses. If your Anti Virus warns you that this application may be harmful, please let us know which Anti Virus you're using and we'll contact them. Because of the nature of remote support applications, many Anti Virus companies choose to be cautious and require us to submit it to be "white listed". This allows them to take a closer look and verify that it poses no threat. When you click the link above you may see one of these popups. With some browsers, choose "Run". With others click the downloaded file name. If your Windows Firewall is on you may have to give permission for it to access the internet. This is required so that we can access your computer remotely. *You may be asked to provide Windows Administrator Credentials for this step. If asked for credentials and you don't have them, you can cancel this step and it may still work fine. Provide us with the 9 digit number found under "Allow remote control"
Once an Execu/Tech support technician has connected you'll see a popup similar to this one in the lower right corner of your screen. If you want to end the remote control session you can click "Stop" at any time. By default, this application runs with the current user's permissions. It's possible that we may need to perform functions that require Administrator level permissions, like performing updates, installing interfaces, etc. The application will need to be restarted using the menu option "Run as administrator". You may be required to provide Administrator credentials. We can't provide this to you so if you don't know it you may have to ask your manager or IT professional. 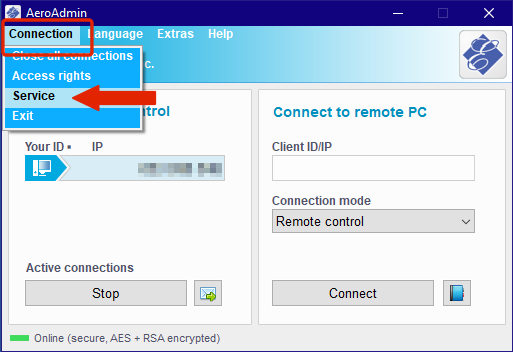 If you want to run this as an unattended application, meaning that Execu/Tech support technicians can connect any time, click Connection and then Service. 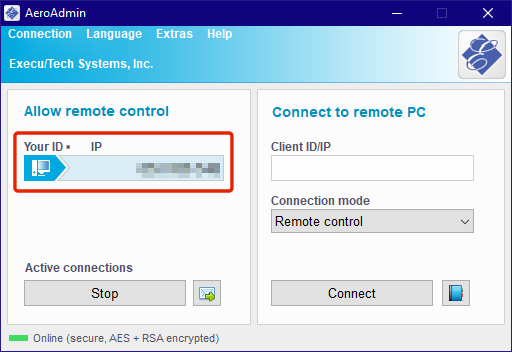 This starts a service that keeps the remote connection application running at all times. You should check with your corporate IT professional to determine if company security policies permit this. If there's no dot after "Service" means the service isn't running and clicking it will start the service. If there is a dot after "Service" means that the service is running and clicking it will stop the service. 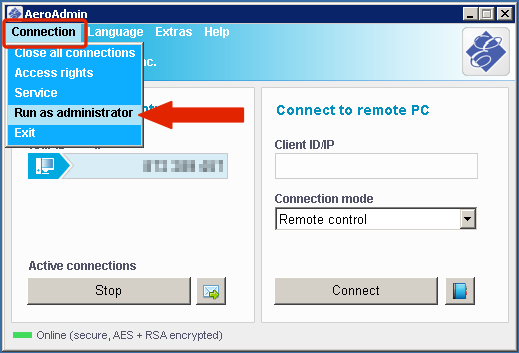 When the remote support application is running as a service, it will display on your screen any time you reboot as a reminder that the application is installed. You can close it and it will continue running as a service in the background. 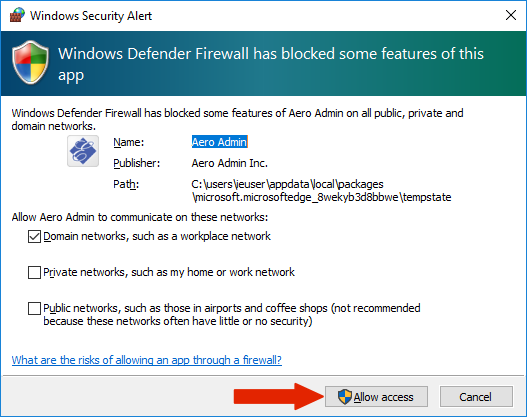 If you're running the on demand version of AeroAdmin, the only troubleshooting you'll need to do is to verify your firewall settings and then closing the application and clicking the link to start it again. If you've installed the unattended version of AeroAdmin, in addition to verifying your firewall settings, you can restart the service. If the AeroAdmin application is open, you can use the instructions above for "Run Unattended" to deselect "Service" and then select it again. If that doesn't resolve the connection problem then you can restart the service.